All three of Duluth’s Protestant cemeteries sit at the edge of town, reflecting their beginnings as a product of the Rural Cemetery Movement. Historically, graveyards were placed in town greens, surrounded by wooden fences that often were disrupted by grazing livestock. Death was an unpleasant and necessary evil, but it was still close by and part of the community’s day-to-day life. Lacking cement vaults and falling victim to cattle grazing and disrepair, it was easy to stumble into ruts made by collapsing caskets. Not only were the burial sites eyesores, but epidemics like yellow fever instilled a fear that they were also hotbeds of infestation. Put this all together with a massive influx of immigrants and a population increase, and out came the Rural Cemetery Movement, which utilized landscaping to create a park-like setting on the outskirts of urban sprawl. These bucolic burial grounds were crisscrossed with tree-lined, well-maintained paths that followed the natural curves of the landscape. 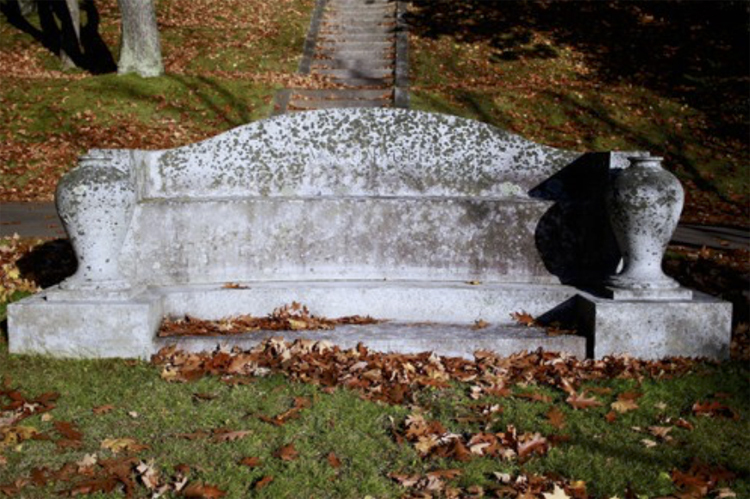 Changing views on death, courtesy of the Victorian era, created an atmosphere of picnics, romantic strolls and dog-walking through rural cemeteries across the country. Like Oneota, Forest Hill Cemetery in Hunters Park is an example of the changes brought by this movement. Originally, Forest Hill was located on the banks of Chester Creek, from East Fourth Street to East Seventh Street, between 12th and 14th Avenues East. In 1888, as a result of all the above-mentioned concerns, the Forest Hill Cemetery Association chose a new cemetery site at 2516 Woodland Avenue, and over the next several years the approximately 700 bodies from the old cemetery were disinterred and reburied at the new location. This rather arduous process took some time, and as might be expected, confusion did occur. In 1912, workmen excavating a basement near 13th Avenue East and Fifth Street were unsettled to find three coffins. No effort was made to identify who they were, but they were quickly taken to the new Forest Hill and reburied. Today, shovels have been replaced by backhoes, and ground-heating methods allow burials during the depths of winter, when the ground is frozen solid. But prior to these innovations, it was common for cemetery vaults to hold dozens of bodies awaiting the warmth of spring. During Forest Hill’s move, there was a backlog that took years to remedy, and remains waited a long time back in the old vault at Chester Creek for their trip up the hill. According to the Duluth News Tribune, by 1892 the old vault was in “terrible condition, as were a number of the caskets of those who have lain long in it.” An inspection reported foul odors and rotted, broken coffins. As a result, the Board of Health enforced a deadline on Forest Hill for final removal. While Oneota has Methodist roots, Forest Hill is primarily a product of the Presbyterians. 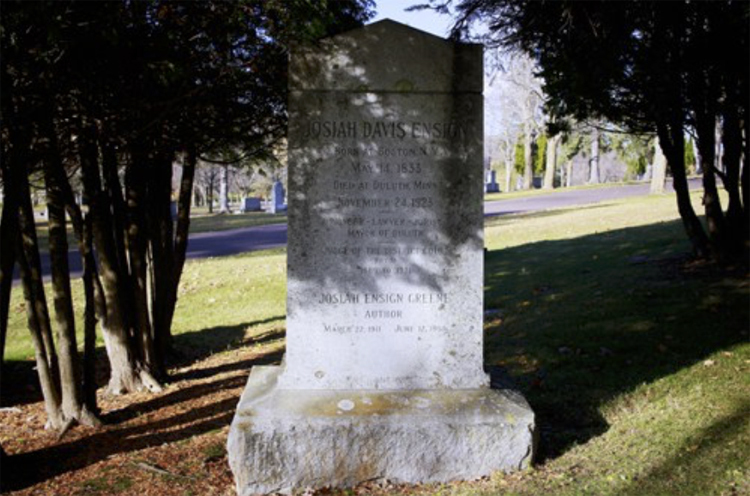 Because most of Duluth’s wealthiest citizens went to Presbyterian and Congregational churches, Forest Hill Cemetery became the place to be once you were dead. Hunters Park, a new streetcar suburb of the wealthy, had only one church: Glen Avon Presbyterian, so convenience was also a factor in the days when horse-drawn funeral processions usually went from home to church and thence on to one’s final resting place. The list of locally eminent personage buried at Forest Hill would fill an early twentieth century Kitchi Gammi Club phone book. All one has to do to fill one’s eyes with historically familiar names engraved on impressive marble and granite slabs is walk up the hill on the old asphalt path from near the cemetery’s entrance and meander one’s way to the top. The path begins near the old sexton’s bluestone lodge, heading east past a big neglected bird feeder, which may have existed in the days when Forest Hill was actively cultivated as a center for birders—100 years ago, there were nearly 100 bird feeders and birdhouses distributed about the grounds. Today, a flock of domestic geese lives at Forest Hill. Walking up this footpath and crossing into Section L on the left, one can find the gravestone of Josiah Ensign hidden behind some cedar trees. Ensign served as Duluth’s mayor from 1880–1884, St. Louis CountyAttorney, and 32 years as a district court judge. Ensign moved to Duluth in 1870 from Ashtabula, Ohio—one of many early citizens who came from there, giving the now-gone Ashtabula Heights neighborhood its name. 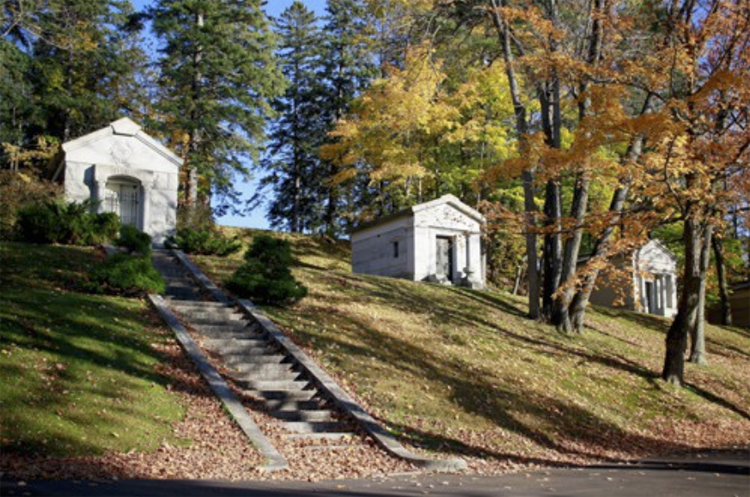 Above, arrayed along the hillside, one can see “Millionaire’s Row,” which includes the family mausoleums of the Ameses, the Sellwoods, and the Hoppmanns, whose family story includes a scandalous Bowery hotel and murder. Theresa Hoppmann, who died during the Spanish flu epidemic, likely was buried without benefit of public funeral. During the epidemic and the aftermath of the Great Fire of 1918, public funerals were forbidden to prevent the spread of contagion. At the foot of the hill below the Ameses is the bench-style stone of William A. McGonagle and his family. McGonagle, who died in 1930, was Grand Master of the local Masons and president of the Duluth and Iron Range Railroad. He was a prominent figure during the ore dock workers strike of 1913, during which his aggressive stance against labor contributed to the rise of the International Workers of the World in local politics. On the other hand, he also stood up against the Ku Klux Klan when they came to Duluth in 1925. After the Fire of 1918, he was appointed to chair the relief commission. 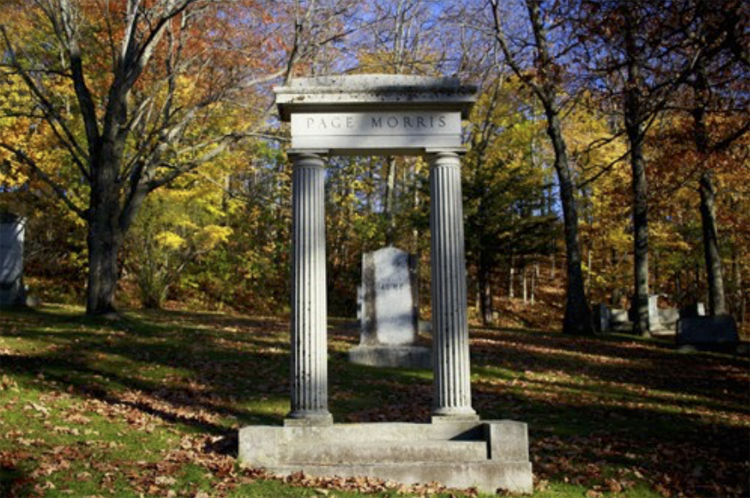 Just down the hill from McGonagle in Section L, one can find the joined two-pillar monument of Robert Page Waller Morris. Page Morris served as a municipal judge, city attorney, 11th district judge, and United States Congressman, serving three terms from 1897-1903. In 1903, he was appointed by President Theodore Roosevelt to the office of United States District Judge for Minnesota.